Okay, okay. Now that I got some of that sappiness out of the way, let’s move on to the good stuff. Today, I’m sharing a recipe for melitzanosalata! 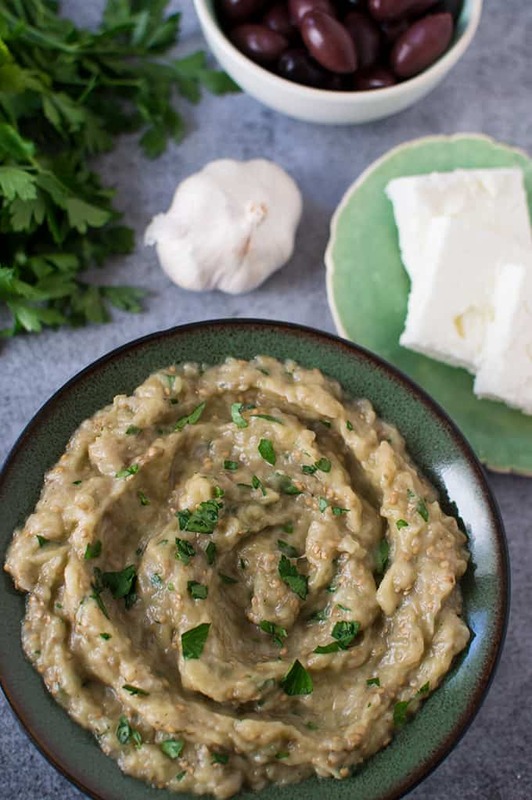 Melitzanosalata (meh-lee-TZAH-noh-sah-LAH-tah) is a classic Greek meze made of eggplant, onion, garlic, extra virgin olive oil, red wine vinegar (or lemon juice, if you prefer), parsley, salt, and pepper. If you were to order a platter of mezedes from a Greek restaurant, there’s a very high chance this will be included. It especially goes great with crusty bread. Melitzanosalata is stupid easy to make, but takes a couple of hours between roasting and cooling time. It also tastes best after a few hours in the fridge to allow those delicious flavors to mingle. To start, you’ll gather your ingredients and preheat your oven to 400 degrees Fahrenheit. This recipe calls for baking the eggplant whole, so you’ll want to use a fork to prick a small handful of holes around the eggplant (this is so the eggplant won’t explode in your oven – because that’s a thing that can happen). Then, place the eggplant onto a baking sheet and throw it in the oven for an hour. Since the eggplant will take a while to cook, I tend to prep the rest of the ingredients while it’s in the oven. You’ll want grated onion, crushed garlic, and chopped parsley. 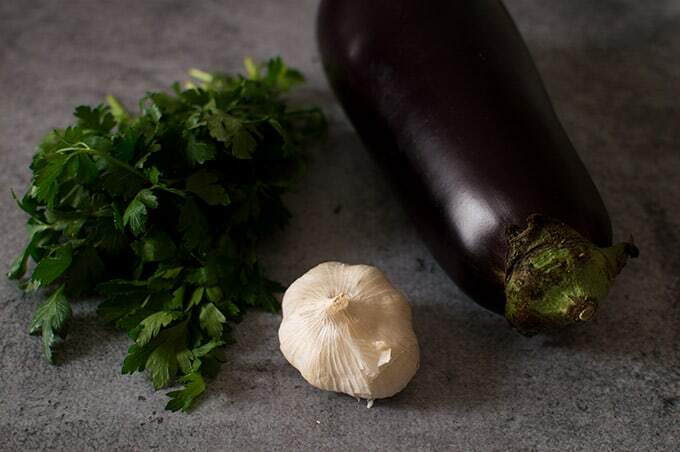 As for the olive oil and vinegar, that can vary depending on the size of the eggplant. I add in anywhere from a third to a half cup of olive oil and add in vinegar to taste. After an hour, take the eggplant out of the oven (it will be soft to the touch) and let it cool for about half an hour. Then, peel off the skin and move the flesh to a colander and allow to strain for another half hour. You might be tempted to skip this step and if you did, it really wouldn’t be the end of the world, but keep in mind that straining the flesh will discard a couple tablespoons of liquid, which does make a difference in the end. I recommend not skipping it. 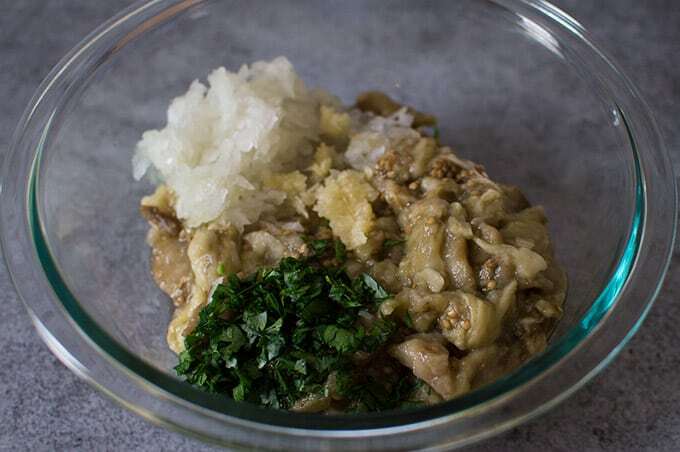 After your thirty minutes is up, grab a medium bowl and add in the eggplant, grated onion, crushed garlic, vinegar, and parsley. Season with some salt and pepper and stir using a spoon until just combined. Then, start drizzling in the olive oil slowly while you continue to stir; you’ll notice the eggplant mixture turn into a tasty dip. Taste and adjust with extra seasoning, vinegar, or olive oil as you like. Don’t forget to serve with that crusty bread! Using a fork, poke a few holes into the eggplant and place on a baking sheet (optional: line the sheet with foil or parchment paper). Bake the whole eggplant for one hour. While the eggplant is cooking, grate the onion and place in a small colander over a bowl or in the sink. Let strain for 20 minutes or until you are ready to make the dip. Remove the eggplant from the oven and let cool for 20-30 minutes. Peel off the skin and move the flesh of the eggplant into a colander and let strain for an additional 20-30 minutes (you might be tempted to skip this step, but straining will remove a couple tablespoons of liquid). Discard the skin. Place the eggplant in a medium-size bowl and add in the onion, crushed garlic, some salt and pepper to taste, 1 tablespoon of red wine vinegar, and the parsley. Use a spoon to stir the ingredients until just combined. Then, slowly drizzle the olive oil in while continuing to stir (start with a 1/3 of a cup, depending on the size of the eggplant. Use more oil if closer to a 2lb eggplant). Taste and adjust with extra olive oil, vinegar, or seasoning if necessary. 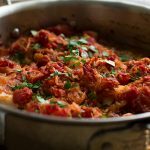 Place in the refrigerator a few hours before serving to allow the flavors to meld together. I made a couple of changes to the recipe and it still turned out great. I cut the eggplant in half lengthwise and reduced baking time to 25 minutes, used apple cider vinegar instead, and skipped refrigeration part at the end. 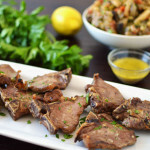 I served it alongside baguette slices, pita bread, hummus and a Greek salad. A complete dinner served! Delicious, light and vegetarian. A crowd pleaser! When you mentioned straining in the colander, is that the same thing as draining, or it different? Thank you kindly for posting this. Hi Becky! Yes, it’s the same thing as draining. I hope you enjoy the dip!